American-born Al Qaeda operative Omar Hammami is not dead yet. If he had really been killed fighting in Somalia six weeks ago, as a government official claimed, he probably couldn't have recorded and released more bad hip hop songs. Also known as Abu Mansoor al-Amriki, Hammami is the Alabama-raised son of a Southern Baptist mother and a Syrian father. Since arriving in Somalia in 2006, he has acted as a mouthpiece for Al Shabaab, the Somali branch of Al Qaeda. As part of his attempt to recruit Western youth for jihad, he has released a half-dozen rap tracks on the internet since 2009. In early March, Somali Defense Minister Abdihakim Mohamud Haji Fidi told the Associated Press that Hammami might have been killed during fighting between Somali government forces, which are backed by soldiers from the African Union, and Al Shabaab. No body was ever found, and Al Shabaab has never announced Hammami's death. The Long War Journal reported in mid-March that U.S. intelligence officials doubted Hammami had been killed. Now Hammami has apparently resurfaced, with two new a cappella songs that appeared on the web earlier this week. In "Send Me A Cruise," Hammami begs to be plastered by a tank shell, a drone attack or a cruise missile, so that he can martyred like some of the heroes he names, including Al Qaeda leaders Abu Musab al-Zarqawi and Abu Laith al-Libi. In his trademark tuneless drone, he claims "an amazing martyrdom" is what he "strive(s) for and adore(s)." "Send me a cruise like Maa'lam Adam al Ansari/ And send me a couple of tons like Zarqawi," chants Hammami. "Send me four and send me more, that's what I implore." Click Here to Hear "Send Me a Cruise." Hammami opens the other track, "Make Jihad With Me," by slowing his voice down to a deep Barry White growl and then invites the youth of the West to make jihad with him, promising that together they will "wipe Israel off the globe." The two songs are the latest in a half dozen released since Hammami arrived in Somalia. All tracks are recorded in a style that's more muzzein than gangsta, featuring echo and other sound effects but no instrumentation. According to the strict interpretation of Islam current in Al Qaeda and other terrorist groups, music is forbidden. Hammami appears to sidestep the prohibition by limiting himself to "singing." In "Blow by Blow," which appeared on the web in 2009, Hammami softly invites American military strikes in Afghanistan and Somalia, "Bomb by bomb/Blast by blast/Only going to bring back the glorious past." The song lasts about two minutes and 30 seconds. Click Here to Hear "Blow By Blow"
The track is aimed at an English-speaking audience with a history lesson for those sympathetic to Islamic holy warriors. In one verse, Hammami explains, "It all started out in Afghanistan/When we wiped the oppressors off the land//The Union crumbled, rumbled and tumbled/Humbled, left them mumbled/Made a power withdraw and cower." In "First Stop Addis," named after the Ethiopian capital of Addis Ababa, which speaks of a love for "slaughter[ing] Crusaders" and references ex-president George W. Bush and former Secretary of State Condoleezza Rice. "We're sending missiles through the streets," he warns in the nearly four minute track. "Destroys tanks, 'copters and Navy fleets." In a March 2009 video Hammami was seen on camera praising a terrorist who died during an ambush and appears on camera saying in English, "We need more like him, so if you can encourage more of your children and more of your neighbors and anyone around you to send people like him to this jihad, it would be a great asset for us." Hammami had been the president of his sophomore high school class in the small town of Daphne, Alabama but became radical in his views and dropped out of college in 2002. 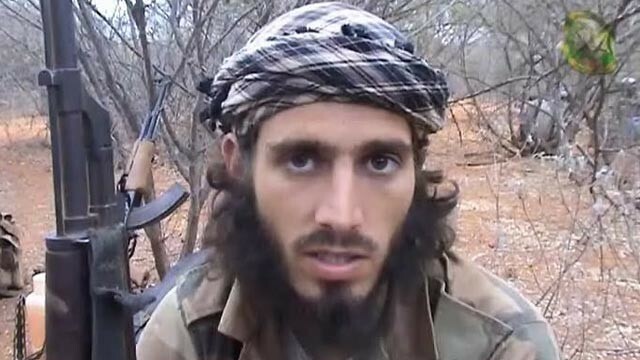 Hammami moved frequently, living briefly in Canada and then Egypt before joining Al Shabaab in Somalia. The continuing conflict in Somalia and Al Shabaab's apparent desire to carry attacks outside of Somalia has many officials concerned about the reach of the terror group. A State Department report released last year mentioned the concern about the training camps in the country, "[Shabaab's] leaders have founded and support a number of training camps in southern Somalia for young national and international recruits to Al Shabaab. In these camps, Al Qaeda-affiliated foreign fighters often lead the training and indoctrination of the recruits."